First DIY of the new year and it involves two of my favorite things: staying warm and emoticons! This super simple project was inspired by Studio DIY's Emoji Ornaments she made over the holidays. Given how much I love to use emoticons with my friends every day, I figured, why not share them with the rest of the world? 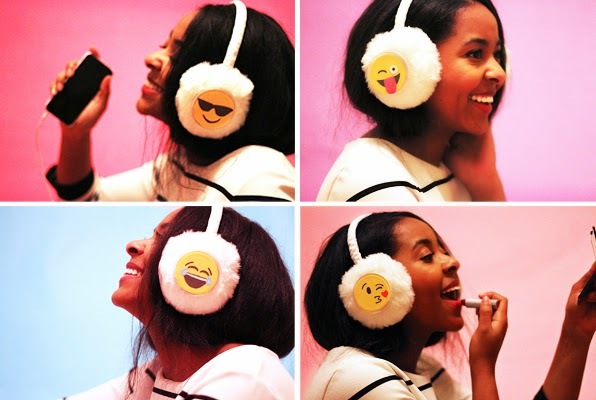 Scroll below for the deets on how to make these interchangeable DIY Emoticon Earmuffs! Here is what you will need: solid color earmuffs (yellow or white works best! ), large clear plastic buttons (with pin backing - like these), colored paper, markers, scissors and glue. All these supplies I got at Michael's! To start, open up a plastic button. Remove the sample paper inside and use that circle as a template. Trace 4 circles on the sheet of yellow paper; these will be the bases of your emoticons. Depending on which smiley you wish to re-create, you can cut and glue more shapes using different colored pieces of paper. for example, to make the 'tongue sticking out' emoticon, I cut a small circle out of white paper for the open eye and then I made the tongue by cutting out the shape on pink paper. Glue everything in place if you add pieces like these. Next, finish the emoticon with black marker to do the eyes, eyebrows and mouth. Once the emoticon is complete, simply place it back into the plastic button case with the emoticon facing outwards. Gently, pin the button to the outside of the earmuff so that it is firmly attached. Make sure you don't do this while the earmuffs are on your head (which would be both quite dangerous and quite difficult)! Continue making as many other faces or emoticons as you wish! The joy of using plastic pin buttons is that you can switch them up anytime! Feeling happy one day - pin on some laughing emoticons. Feeling sad it's so cold you need to wear earmuffs in the first place? Pin on some grumpy ones! When it warms up outside, you can easily pin these to anything else - clothes, backpacks, purses, or notebooks. Have fun and feel free to share what you think or made! Cool outlines. My top choices would be the terrarium, and shockingly, the child toys. Much obliged for the arrangements, here's to you!thanks for sharing this beautiful work. If you are looking for tips, guides, any help you can take a look here for your needs. Very innovative ideas of making custom earmuff in a funny way. The young generation would love these ideas especially college students who are enjoying their college life as they are taking quality dissertation writing service UK so they can concentrate on their other academic activities. And your looks stunning with custom made laughing earmuff. Fantastic idea of making Emoji Ornaments. Now a days college students love these idea. My academic students are making emoji ornaments and doing such a creative activates and are also love these funny things, who are come to seek personal statement writing help from me at http://www.personalstatementfolks.co.uk/. I love your blog and thanks for sharing such a lovely post with us. Really very nice earmuff. You are doing great, now a day every person use ear phone, bluetooth etc. but you are doing different to other, I would like to share this images with my UK college students, who are looking for assignment writer Sydney from me. I would like to share this idea with my friend also. Keep it up.. and share here with new idea. I like your positive site and the info you gave here. It's a pleasure to be with you. Thanks for sharing best idea of making emoji ornaments. An emoji that describes your feelings. These fun and surprisingly quick-to-make emoji ornaments will add instant personality to your tree. One of my students are always making this types of funny emoji ornaments, who are come to seek assignment help UK from me at Elite Assignment Help. I would be happy to share this post with him and hope he would like it. Lovely Earmuffs! Really nice images of emoji is shared here. I love your fabulous idea. I would love to share this funny post with my CV maker team who provide professional CV services at CV Folks and also our students who like this funny things. Share more idea with us. Waiting for your next post. I like your idea. It look really nice. I think it could be a good decision for your school time. Emotions often make a person able to express his feeling to overall the world. Being writer of a dissertation writing service company, I am writing a dissertation on background of emotion earmuffs. This post is very amazing. Being writer of a dissertation writing service company, I am writing a ​buy order generic viagra on background of emotion earmuffs. Very well described.Facing issues in your Yahoo .we are here with a solution contact us anytime. Please keep your printer model ready, before you contact our Canon technical support expert.and for information visit http://printershelps.com/lexmark-support . Printers are the most needed devices for our day to day work and when you get to face some technical issues with Epson printer get connected with us. Call us Epson printer Support Number 0808-238-7544 UK at any time and your issue will be resolved. We should use external medicines for normal pain, massage in most cases one of the best solution for these problems. Best Online Coursework Writing Thanks for sharing this great article with us. Female Escorts :To qualify for the globe Billion Dollar Contest, the participants were 1st pre-selected. The chief criteria were that the contestants should not be frightened of the dark, hidden obstacles and danger, together with death. Solely one hundred entered the ultimate with a live, world-wide audience of billions. Link training and HR for strategic iphone messages recovery value: When learning and performance functions converge to create a true talent development usb flash drive data recovery software for mac framework, both functions benefit by becoming more relevant to supporting the organization's critical strategy. Traditional organizational development activities important to the business, such as managing mandatory compliance and certifications, are improved by automated tracking and reporting. It's a very creative idea of making earmuff ornaments. Thank you for sharing this tips how to make earmuff? We appreciate your innovative idea. hange Wifi settings using Linksys cloud account – It is important to change the basic WiFi settings on your router in order to establish a unique and secure connection. A protected WiFi prevents unwanted access to personal information. ot.com/safe & Activate Webroot Safe. Microsoft Office is one amongst the most useful productivity suites for Mac and Windows. Log in office.com/setup and browse various packages for Office 2019, Office 365, Office 2016, Office 2013, Office 2010 and more. After downloading and installing its setup, activate it with the product key. Office.com/setup- Windows 10 S is very similar to Windows 10 Pro, with a few key differences. office.com/setup- Now Users easily can install Office 2016 with a product key in Android mobile devices as a package or as an individual application. Mcafee.com/Activate- As the basic antivirus package of McAfee, users can safeguard their PC, Mac, smartphone, and tablet from viruses, online threats, and phishing sites. norton.com/setup - Norton antivirus help to protect your pc from dangerous viruses like Malware and Trojan.